No nighttime spectacular has taken a road to prime time quite like Animal Kingdom’s Rivers of Light. There were speed bumps, construction delays, malfunctioning vehicles, and dissatisfied supervisors. That tumultuous road is now in the rearview mirror and Rivers of Light moves full speed ahead. 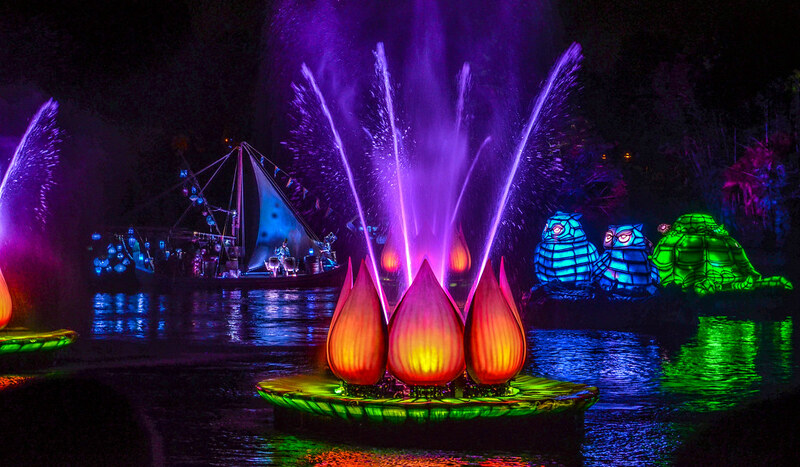 Animal Kingdom’s nighttime show is now playing multiple times a night. 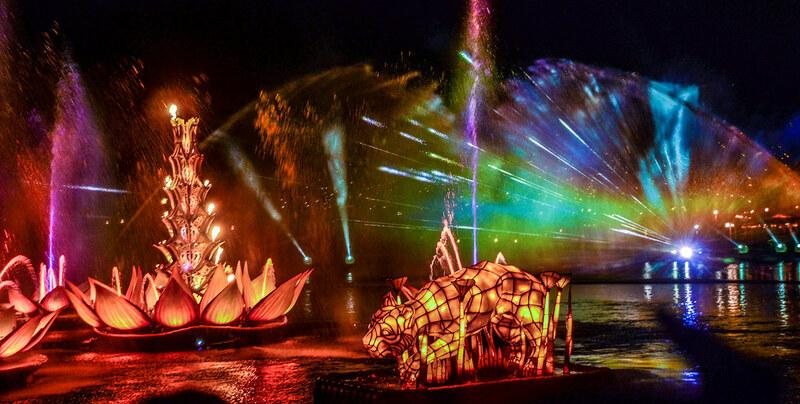 We recently saw Rivers of Light and this post will offer a review as well as some strategy. I’ll go with some strategy first, then those that don’t want the show to be spoiled can skip the review. Right now, the best way to view Rivers of Light is with a FastPass. This will give you a reserved seat on the Asia side of the theater (as opposed to the DinoLand side). With Animal Kingdom not having many E-ticket attractions, and the wait times going down throughout the evening, using a FastPass here isn’t a bad move at all. On the other hand, if you do use FastPass+ for this experience, you won’t be able to do more than three FastPasses in one day. That’s the biggest negative but as long as you’re okay with forfeiting your rolling 4th FastPass for the day then I’d recommend using one here. Along those same lines, a dining package would reserve you a seat in the DinoLand section. If you already want a meal at the Tusker House or Tiffins then the dining package will offer that meal at a slightly higher price to get you a reserved seat. I haven’t tried it personally but the Tiffins dining package can actually save you money if you order the right things. 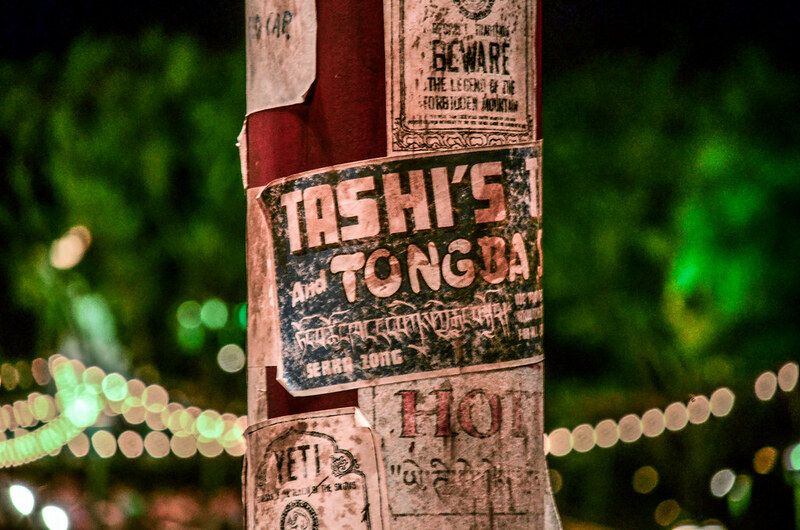 If you are on the dining plan then the Tusker House also makes quite a bit of sense. For those of you that don’t want to go the FastPass or dining package route then you will be stuck waiting in line. 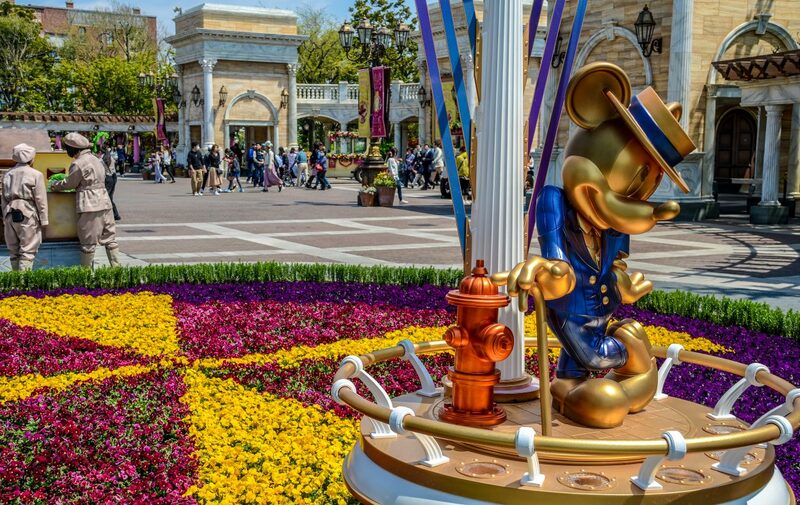 Depending on how busy the parks are then you may be waiting for close to an hour. If you absolutely have to see the first showing (typically around 8:30) then lining up at least a half an hour in advance is the smart thing to do. You will be seated in the DinoLand section and the line will be over there. If the first showing isn’t a necessity then you should go to the second showing. This showing will be less busy and you won’t have to line up quite so early. Obviously, the earlier you line up the better your seat regardless of if you have a FastPass, dinner package, or going via standby. 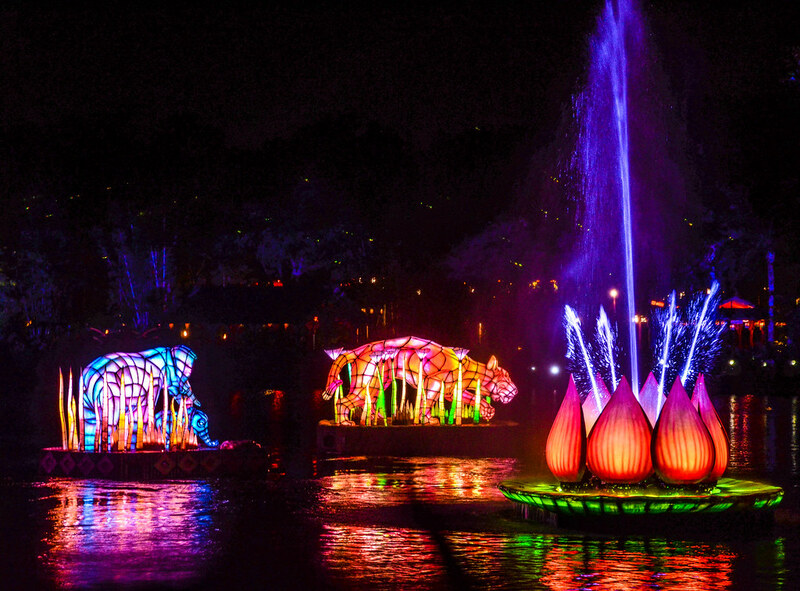 One last little note is that if you like to photograph Animal Kingdom at night I’d advise going to see the first show of Rivers of Light. They ushered guests out of the theater pretty quickly and in only one direction after the 2nd showing. The park was also empty after the first showing even though it wasn’t closed and it’s fun to wander around without many people there. 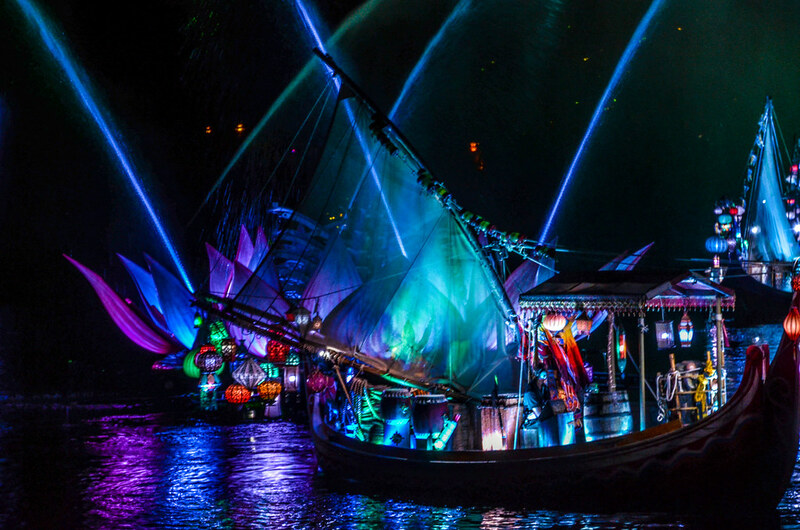 Speaking for myself, my ideal strategy would be to get a FastPass for the first showing of Rivers of Light and then go experience Pandora – World of Avatar or take photos afterward. I don’t have kids to think about and am a night owl so your ideal plan may be much different. Rivers of Light starts several minutes before the actual showtime, as the trees across the Discovery River light up in blue and are filled with fireflies. 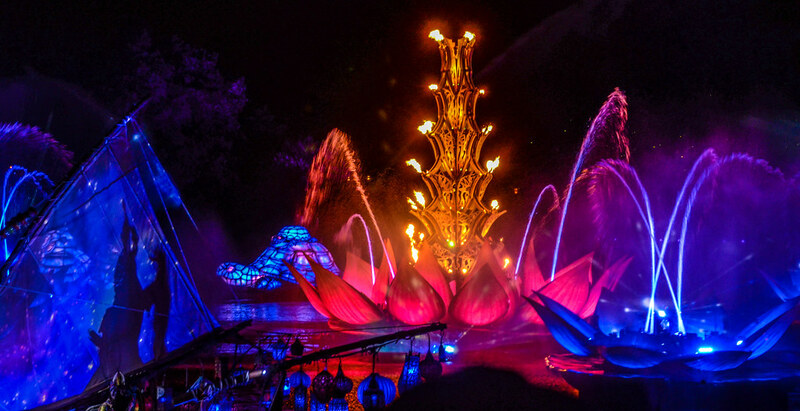 Animal sounds are heard from around the area and lotus flowers, which are the star of the main show, slowly float into position. The ambiance is set quietly, without fanfare but the feeling fits the park that holds it which is a theme throughout the show. Animal Kingdom is a park best experienced at a slower pace. Leaving time to see the details, explore the trails and soak in the atmosphere are a huge part of that park. A nighttime show to fit that mood would be difficult to attain but that didn’t stop Imagineers and show designers from trying. Did they succeed? Yes, for the most part I think they did. 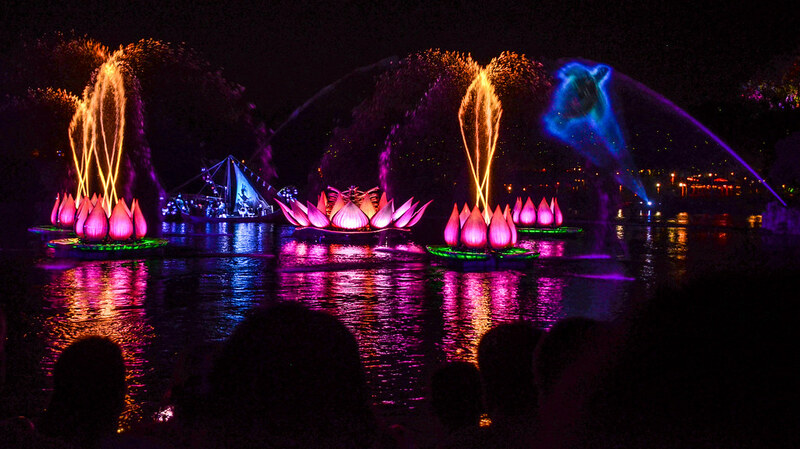 As Rivers of Light begins, the show artfully progresses from the lotus flower floats to animal floats joining the scene. The flowers open up (bloom?) and start shooting water. Boats eventually join the scene with shaman who are using shadow puppetry to act out the show. At least I assume they were acting out the show, to be honest my eyes weren’t drawn to the boats nearly as much as all of the other floats. 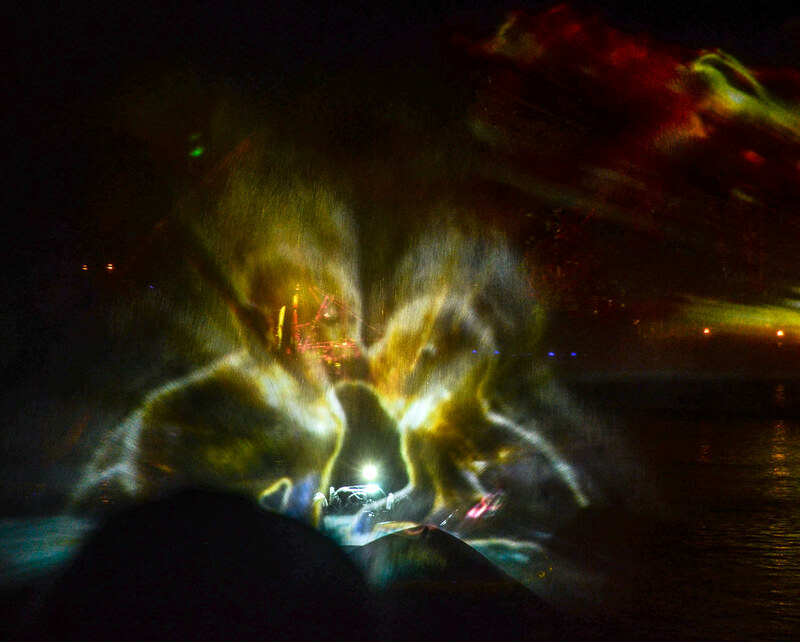 The show moves between these floats dancing around the water and projections on a mist screen. 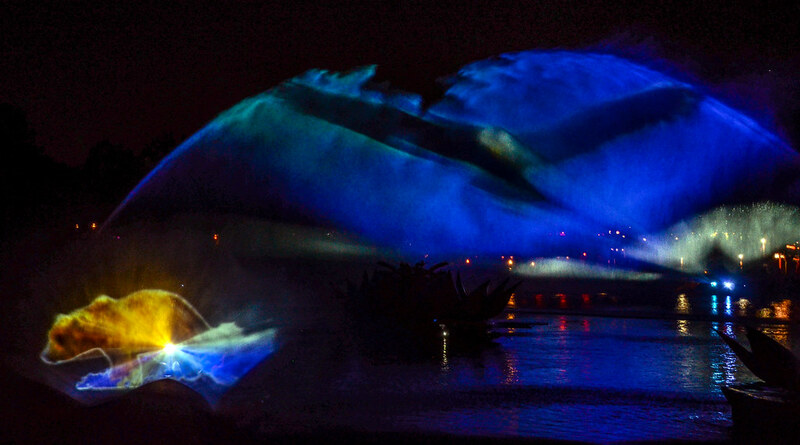 Rivers of Light is very abstract and tells a story on unity. That theme comes through in short scenes that don’t really have much story in them. In a way, I think that helps Rivers of Lights transitions as there is no marked beginning or end to a certain section. I do think that abstract nature makes the show slightly less kid-friendly though. Think of it like Epcot’s Illuminations (if you’ve seen it) but without the fireworks. There is certainly more to look at in Rivers of Light then just a globe but the heart of the show is the same as is the lack of story. River of Light wouldn’t succeed without the soundtrack. The songs played throughout the show are beautiful and different from any other nighttime spectacular at a Disney Park. They are distinctly Animal Kingdom. The show isn’t without its faults though. 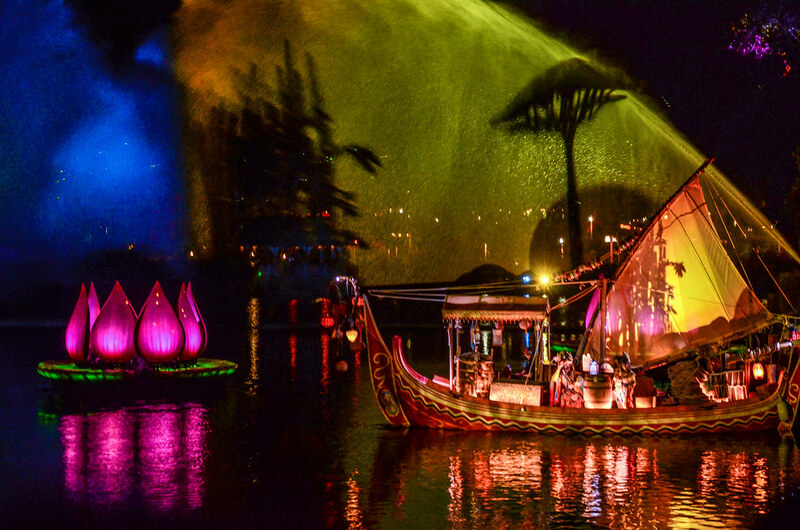 While most nighttime spectaculars are a steady build to a grand finale, Rivers of Light never makes it to that jaw-dropping moment. Maybe that’s by design but I think the show could use a tad more oomph at the end. I also think the boats add a cool effect but could be utilized a little more. I don’t think that those negatives bring the show down much though. 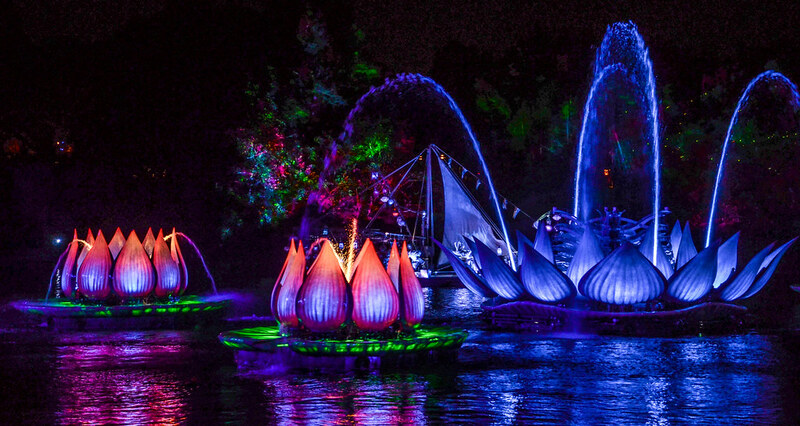 Rivers of Light is beautiful through and through. I love that no Disney film or story (aside from the DisneyNature series) was brought up in the show. I think the giant lotus, which opens up at the end with fire, is a great centerpiece. The projections were mostly crisp. The theater looks great and the integrity of the show is a perfect fit for Animal Kingdom. I understand why the show isn’t for everyone though. 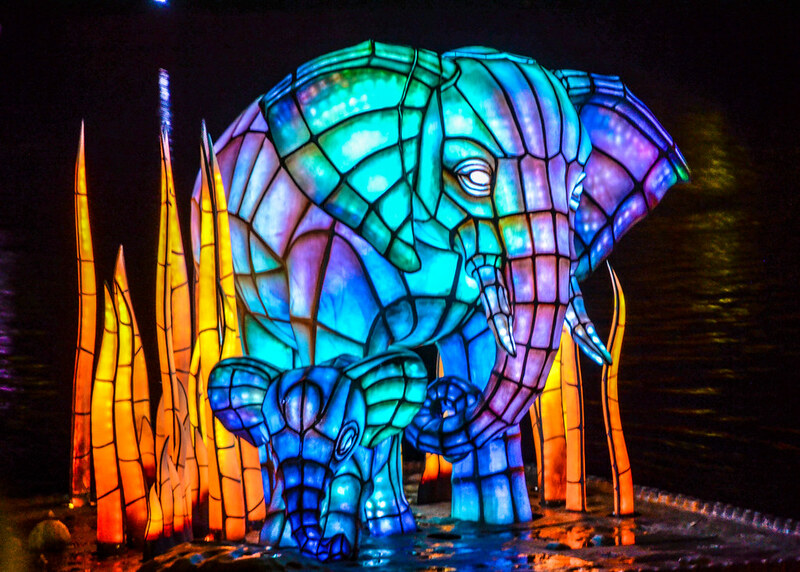 For those that like attractions and shows fast-paced, Rivers of Light might not be for you. I think it is a beautiful, steady show that is one of the better nighttime spectaculars Walt Disney World offers. If you have any questions about Rivers of Light or Animal Kingdom, leave us a comment and we’d be happy to get back to you! If you enjoy what you’re reading please like our social media pages, both of which you can find on the right side of this page, and share our site with friends. Thank you for reading and your support, we really appreciate it! Hi Andrew! I will be visiting in August 2017. Since the second showing technically starts after the park closes (10:30p), do I need to stay on property and have access to EMH to see it? Or can I see it on standby as long as I start lining up before 10? Hi Tina! Great question. The only place that the Extra Magic Hours applies to in this instance are the attractions in Pandora. You’ll be able to see Rivers of Light at 10:30 without any problem. The park technically closes at 10 but they often schedule a show half hour after close for whatever reason. Getting in line around 10 should work pretty well but I’d also recommend checking for a FastPass on the app around 7 or 8. By that time you’ll probably be done with whatever other Fastpasses you’ve used that day and there often some available for the 2nd showing of Rivers of Light. If not, just go with your original plan. Sorry for the long-winded answer!